Takeaway: If gardening feels like an overwhelming and back-breaking task, you might want to consider hügelkultur. This ancient technique uses heaps of decaying wood and plant material to turn garden beds into tall, easy-to-reach mounds with built-in nutrient and water reservoirs. Hügelkultur, pronounced hoo-gul-culture, is a German word for “hill culture.” It is a method of gardening that has been used in Germany and Eastern Europe for centuries and remains a common permaculture practice. Essentially, it is a pile of decomposing wood covered in soil that creates a mound you can plant in. Hügelkultur mimics natural nutrient cycling. In nature, when a tree falls, it becomes a nurse log that other plants will attach their root systems to. As the nurse log decomposes, it releases nutrients for the other plants to take up at their leisure. It also becomes spongy and holds water for the plants to drink whenever they get thirsty. Hügelkultur beds use the concept of a nurse log to create a prime environment for growing. In fact, it’s almost self-sufficient. Most of the work for the gardener will take place initially when setting up the bed, and then it is low to no maintenance for the rest of the season. This type of bed is also ideal for areas suffering from drought conditions. The buried logs make up the bed’s irrigation system by acting as reservoirs that store rainwater and release it as needed. Large beds made with large logs will hold the most moisture and will need to be watered less, if at all. Unless there is a long-term drought, you may never even need to water. Smaller beds made with only sticks and debris will probably still need to be watered regularly, however. It is also a good idea to cover your bed with mulch, which will help conserve even more water. Since the wood in the pile is decomposing, a hugel bed is warm enough to extend your growing season. You can successfully plant earlier and later in the year. Also, you can plant immediately after building your hugel bed. While you will get a good crop the first time around, expect your harvest to multiply by five times within three years. This is the kind of garden that improves with age. What’s more, you won’t have to till the soil in your hügelkultur bed. 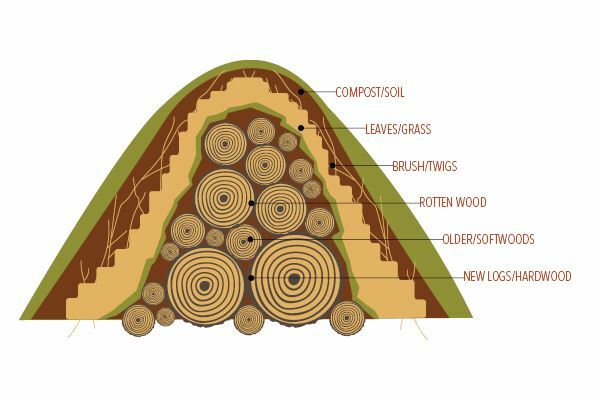 Not only does the shape of the hill prevent soil compaction (See: Combating Soil Compaction), but the decomposing logs and beneficial fungi break up the earth for you and improve aeration. The result is rich, loose, black dirt. If you have physical issues that make it uncomfortable to bend over, the height of hugel beds allow you to stand while you harvest your veggies. The height and shape of the beds also increase the square footage of available planting space compared to a flat or even a raised garden bed. To create your own hügelkultur bed, you must first choose your location. A 6x3-foot area is ideal, but you can make your bed smaller or larger. Just note that in smaller beds may need you to add more material to them over the years. Also keep in mind that gardeners using this method claim that the fruits and vegetables grown on the north side of the bed taste sweeter and those planted on the south side. So, plan accordingly with your crops. If your chosen site has grass, dig up the sod. Next, dig down one foot into the earth to create a shallow trench. This is where you’ll bury your wood and leaves. You’ll need wood that is already decomposing as freshly cut wood will leach nitrogen instead of releasing it. Look for fallen trees, branches, twigs, and leaves that have been lying around for one to three years. Keep your eyes open for mushroom growth, which is a sign of decomposition. You’ll want to use hardwoods because they take longer to decompose and can feed your hugel bed for 20-30 years. For best results, choose alder, apple, aspen, birch, cottonwood, Douglas fir, hemlock, maple, oak, poplar, and willow. However, avoid cedar, locust, and walnut trees because they are slow decomposers and inhibit the growth of other plants. Once gathered, place the largest chunks of wood on the bottom of the pile. Next, push vegetative material in the crevices and corners between the wood, and then top with organic materials such as manure, compost, straw, or hay. This adds nitrogen to the pile and helps to maintain a proper carbon to nitrogen ratio during composting. Just take care not to use invasive plants as the vegetative filler or else they may take over your new bed. Continue adding layers, alternating wood with organic materials. Again, the larger pieces of wood should be on the bottom and the smaller pieces on top until the bed reaches your desired height. Then, take the sod you removed and place it on top of the pile, grass side down. Cover the sod (topdress) with the dirt that you set aside when you dug the trench, compost, and topsoil until there is a two to six-inch layer of soil covering the bed. Finally, finish with a layer of mulch, such as leaves, wood chips, or straw. You could also plant clover immediately to serve as living mulch. That’s all it takes. Your hügelkultur bed is ready for planting, which you should do immediately so that wild plants don’t take over this prime real estate. There are a few variations of this method to note. If you like the look of raised beds in your garden and don’t want to dig a trench, you can pile your woody materials into a raised bed and cover with compost and soil for the same results. You can also take advantage of this technique when planting trees and bushes. Dig the hole deeper than you normally would so that you can put logs in the bottom of the hole beneath the tree and fill in the crevices with dirt. As the logs decompose, the tree will have constant access to nutrients and water—and you don’t have to install an additional irrigation system. If you love growing your own food and but don’t have a lot of time to work in the garden, hügelkultur beds are a great solution. After the initial set up, nature will take over and all you will have to do is harvest your yield.